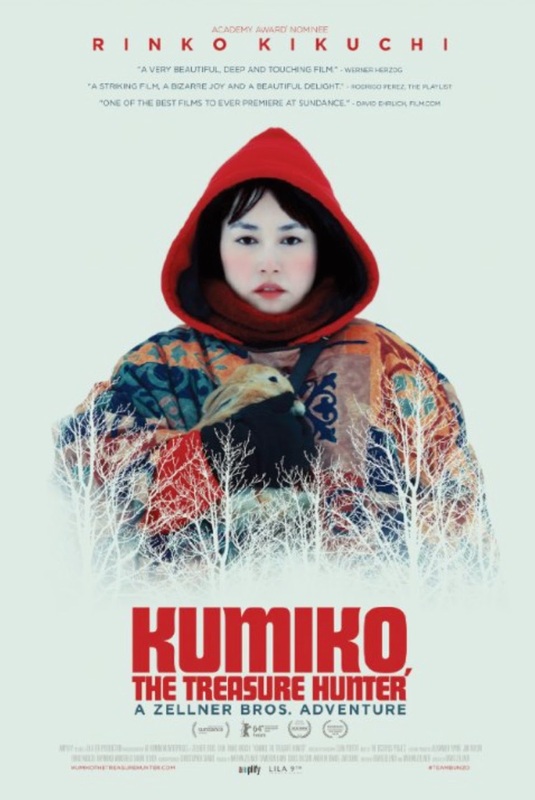 Infinite Art Tournament: At the Movies: "Kumiko, the Treasure Hunter"
Ebert: Never got to see it. Provenance: Watched at the fabulous Hollywood Theater with Mrs.5000, but not Patrick. We have been told stories about quests all our lives, so we know what kinds of behaviors and virtues will be rewarded if someone is just heroic enough to persevere in following a dream. We know that they will find a few steadfast allies, but that there will be villains to be defeated. We know that when society laughs at someone on a quest, it is society that is wrong. We know that it is the boring people who stay at home and never go out seeking their destiny who live small, pitiable lives. We know all this about quests, but for some reason we don't actually spend much time questing. Kumiko, the Treasure Hunter is the story of a heroic quest as it would play out in the real world. It is unsatisfying, and unsettling, because it has an odd, quixotic realism that undercuts all of your assumptions about what is supposed to happen in a story. Fortunately, there's a happy ending. Or is there? Plot: A woman discovers a carefully wrapped VHS casette of the movie Fargo under a rock in a sea cave. Now, that's pretty weird already, and it's only the opening scene. When she watches it, the obvious question strikes her -- how can she get her hands on the ransom money that the Steve Buscemi character hides in the snow? To start with, she'll need to find a map of Minnesota. Visuals: Very lovely. Kumiko's red hoody blazes against muted cityscapes and snowscapes. Later, the geometries and riotous colors of an old motel comforter will play against organic shapes of bare tree limbs and ice. There are lots of pretty things to look at. Dialogue: Spare, roughly half in Japanese and half in English. Often, the awkward words of someone completely failing to make any kind of human connection. Prognosis: More of an artwork to be appreciated than an entertainment to be enjoyed. That sounds damning, but it's not. It's actually fairly entertaining, but it's a top-notch moving picture. Wow, I completely agree with this review, and yet for me it was a beautiful film about social isolation, depression, and mental illness. Throw in themes of cultural displacement, and urban and rural wilderness. And, due to a rather peculiar set of convergences, a "happy" ending that made me cry longer and harder than any movie in my memory. Still playing at the Hollywood Theatre. I recommend it. I completely agree with that comment.